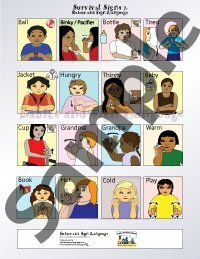 This sign language chart can help you and your baby or toddler baby learn to sign basic vocabulary in sign language using this custom illustrated, detailed chart from Babies and Sign Language! Viewing Survival 2 Poster. See Survival 1 Poster or the Survival 3 Poster!